As we approach Valentine’s Day, our minds understandably turn to romance and dreamy escapes. This got me thinking, is there anywhere better to indulge in a romantic tryst than in a hotel on an Italian lake? Italian lakes are seductively beautiful - think terraces covered in bougainvillea, pastel houses and narrow lanes that have hardly changed in years. You’ll find this kind of local in none other than the romantic lakes running through the mountains of North Italy. These lakes boast an old fashioned elegance that allows you to indulge in dressing for dinner, retro cocktails and stay in hotels resembling wedding cakes with rooms stuffed with stunning antiques. So, if you plan on locking yourself away for a weekend, then might I suggest one of these grand hotels with breathtaking views that can be enjoyed without leaving your room. Lake Como is the Grande Dame of the Italian lakes. It’s the kind of place that serves as a source of inspiration to all the romantic poets, and Villa D'Este is probably the most famous of its lake hotels. Villa D’Este is everything you’d imagine it to be - a beautiful old villa adorned with Murano chandeliers and set in a manicured park. Complete with endless terraces and statues leading to a magical floating pool. It's hard to think of a more romantic destination on Lake Como. And it’s certainly not surprising that the hotel was adored by Elizabeth Taylor. A short hop from one of the Milan airports and you can immerse yourself in romantic history. Lake Orta is probably the least known of the Northern Italian lakes and yet it could be straight out of a fairytale. It is a mystical lake with an enchanting island right in the middle. To make it even more dreamy, the pretty town of Orta San Giulio lies between the lake and the Alps. The place to stay for a romantic getaway is the Moorish palace known as Villa Crespi. 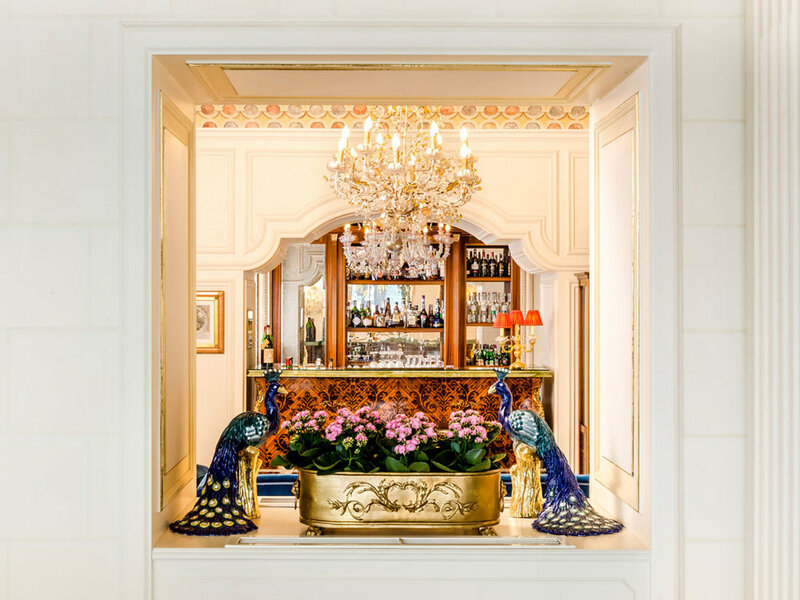 To make your getaway complete, fulfill your princess fantasies and dine amongst the ornate columns of the two-star Michelin restaurant, Cannavacciuolo. Yes, I know I've mentioned Grand Hotel Villa Feltrinelli before, but the thing is, it’s the most romantic hotel I have ever stayed in, and it would be remiss of me to exclude it from this list. In my opinion, Lake Garda is one of the most breathtaking destinations not just in Italy, but in the world. The villa is reminiscent of an exquisite wedding cake and there is a shiny wooden boat waiting to show you the lake. It is situated in the beautiful village of Gargnano on the western shore of Lake Garda, which is more authentic and less touristy than most of the other villages on the lake. Plus, you don’t get much more glamorous than a hotel that smells of Acqua di Parma products. Lake D'Iseo didn't receive a lot of press until the art installation Floating Piers put it on the map a couple of years ago. You may recall the iconic photographs on Instagram of the golden path criss-crossing the lake. The installation may have gone, but the charming lake remains. Tucked away in the hills of Franciacorta, there is a beautiful hotel with views of the Lake D’Iseo in the distance. If you really want to crank up the romance, book the Cabriolet suite, which features a retracting ceiling that gives you the most perfect view of the stars. Stresa's faded glamour is all part of its romantic charm. Step back in time at Villa Aminta, with its glorious views of the lake’s beautiful Borromean Islands. This is a hotel dripping in opulence. From the coloured marble floors to Chinese vases to yet more Murano chandeliers. This is another spot where Elizabeth Taylor and Richard Burton could be found lounging around. It's true that Lake Maggiore and Villa Aminta offer nothing short of pure old fashioned glamour! I hope you feel inspired for Valentine’s Day and that you find yourself at one of these romantic destinations very soon!